DRM: Uniloc SoftAnchor. Use Patch 1.1 to remove. Patch 1.1 removes DRM and fixes various issues. Delete or rename slate_ap.sfd, slate_obsidian.sfd, and slate_sega.sfd. 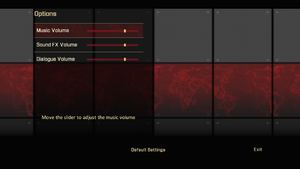 Can be forced in the video card's Control Panel. For other methods see Anti-aliasing (AA). In Display Count Enter 3. Enter your desired resolution into Detected Resolution. Press F11 during gameplay to activate your chosen FOV. Change MaxAnisotropy to one of the following values: 0, 2, 4, 6, 8, 12, 16. If you are a Nvidia user enable FXAA from Nvidia Control Panel or NVIDIA Profile Inspector. Or use SweetFX by CeeJay.dk. Open Alpha Protocol driver profile via Nvidia Inspector. Change Antialiasing - Setting to 4x [4x Multisampling] or one of the other MSAA options. 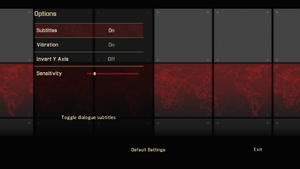 Default Nvidia profile has wrong anti-aliasing compatibility bits for Alpha Protocol. Therefore, when MSAA forced through video driver in-game dialogue choices show missing. XInput only. Must be enabled in-game. Needs a workaround on Vista and later; see No surround sound. See Helix Mod: Alpha Protocol. Install Patch 1.1 to remove the activation requirement. 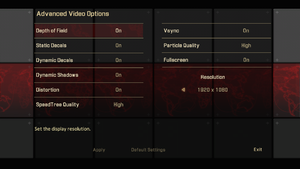 Setting the graphics tweaks as previously mentioned will disable background streaming and make the jerky camera occur less often. Using and enabling a controller will all but eliminate it. Some animations may look unnatural but it can be fixed with some tweaking. When MSAA anti-aliasing enabled via video driver with default anti-aliasing compatibility bits this issue seems to occur. See Anti-aliasing (AA) for the solution. 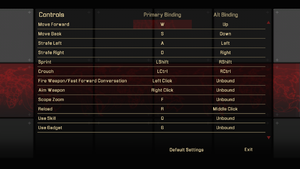 The graphics settings for Alpha Protocol are rather basic. There are some other settings which can be altered in the APEngine.ini file, found in the configuration files location. Before editing the file you must right click it, select properties, and uncheck the "read only" box. 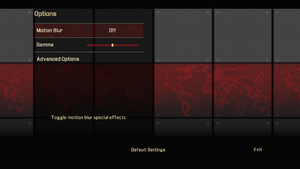 Editing the following settings should improve the game's graphics. It is highly recommended to make a backup of this file before editing it. Afterwards, check the "read only" box in the file's properties. ↑ 1.0 1.1 File/folder structure within this directory reflects the path(s) listed for Windows and/or Steam game data (use Wine regedit to access Windows registry paths). Games with Steam Cloud support may store data in ~/.steam/steam/userdata/<user-id>/34010/ in addition to or instead of this directory. The app ID (34010) may differ in some cases. Treat backslashes as forward slashes. See the glossary page for details. ↑ Ultra wide 21:9 fix ? This page was last edited on 5 November 2018, at 21:27.